This essay from our archives is every bit as relevant today as it was when we first published it in 2010. 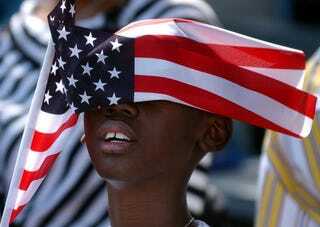 What, to a black American in the age of Barack Obama, is the Fourth of July? I answer: the day that reveals to him, more than any other, how much America owes to blacks and their struggle for freedom. If it hadn't been for people like Frederick Douglass, this would not be a country worth living in. The lofty ideals of the Founding Fathers would have been no more than stirring but empty rhetoric. I know that such sentiments go against the grain on a holiday dedicated to ritualized celebrations of the Declaration of Independence. But let's not kid ourselves. That stuff about all men being created equal was not meant to apply to people like us. If it had been, Douglass would never have had to ask the electrifying question in the famous speech he delivered in 1852: "What, to the American slave, is your 4th of July?" If the founders had really meant what they said, there would not have been any slaves. A century and a half after Douglass' speech, there is much to celebrate because blacks and their allies took the Founders' words seriously and tried to make them real. Thanks to the centuries-long freedom struggle in which Douglass played such a key part, blacks — and other minorities and women — are no longer second-class citizens. One of us leads the nation, doing his best to resolve the manifold woes inherited from his feckless predecessors, all of them white males, like the Founding Fathers. The hopeful trope that got him elected is that these are the United States of America — one nation, one people, unified by a collective pursuit of a common dream. One of our great political parties still bases much of its appeal on the age-old racial resentment of whites unnerved by the political emergence of people like us. Too many of our white fellow Americans still regard us as inferior and illegitimate. They don't want to share the nation's rewards and responsibilities with us. They want it back. Most of us, on the other hand, yearn for the day when July Fourth does not invite the ambivalence we are feeling this weekend. We long for the day when we can cherish the country we love without feeling torn by the two-ness that W.E.B. Du Bois wrote about in The Souls of Black Folk. And just as Douglass accurately prophesied the death of slavery in his famous speech, that day is coming. It's coming because of the determination of true patriots, of all races, who believe in the Founding Fathers' beautiful promises more than the Founding Fathers did. It will be our birthday present to America. Jack White is a regular contributor to The Root.